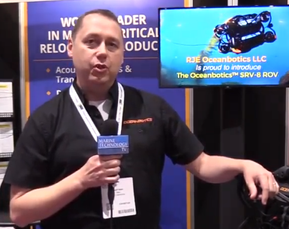 The capabilities of Kongsberg Maritime’s cNODE series of transponders for underwater acoustic positioning and data link are expanding with the introduction of cNODE IQAM at Ocean Business. In a first for the established technology-leading transponder range, Kongsberg is offering the ability to log internal sensors and/or customers’ external sensors, transforming cNODE into a compact, self-contained subsea monitoring system, complete with data processing, positioning and data communication functionality. Data outputs from cNODE IQAM’s range of internal or external sensors are logged and processed with onboard data analysis algorithms to provide the key events operators require. The intelligent data acquisition processor on board the cNODE IQAM is capable of running custom algorithms or standard event analysis based on simple statistics of min/max and mean, with set values used to trigger alarms. Internal sensor modules are available for cNODE IQAM to measure inclination, acceleration, pressure and sound velocity. External sensors that can be seamlessly interfaced include Kongsberg Maritime’s Contros Co2, CH4 and O2 sensors, ADCPs, pressure sensors, inclinometers and current meters. More sensors can be added according to customer requirements. Data is transmitted using robust Cymbal acoustic protocols to cNODE Modems or any modern portable, or vessel-installed KONGSBERG HiPAP SSBL system. Cymbal is Kongsberg Maritime’s proprietary digital telemetry solution, offering numerous protocols to ensure the robustness of data transfer depending upon the environment. 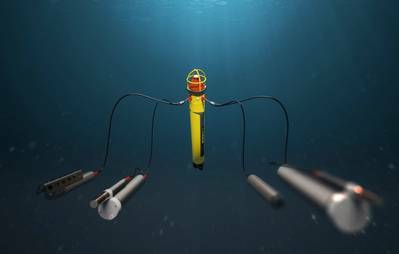 cNODE IQAM can operate with both internal and external batteries and features low power electronics and configurable sensor logging intervals to maximize subsea deployment time. cNODE IQAM can be built from a range of materials including hard anodized aluminium through to super duplex stainless steel for corrosion resistance. It is available in two sizes using standard cNODE Maxi and cNODE Midi housing designs, depending on battery requirements.